I first saw ‘Jerusalem’ by Yotam Ottolenghi while Christmas shopping at my local Chapters bookstore. I had a good flip through and took pictures of a couple of the recipes that I would like to try at home. I do this once in a while to try out a cookbook without buying it or taking it out of the library. Then, if the recipe is something that I enjoyed both making and eating, I may buy the book. The first recipe I tried was Roasted Chicken with Jerusalem Artichokes and Lemon. While the recipe was easy to follow, we weren’t that enamored with the flavour. I put the book to the back of my mind until it got voted in as the Chowhound Cookbook of the Month for January. I hadn’t ever joined in on the fun of cooking and sharing with people using the same book before so when saw the book at Costco again I put in right on my Christmas wish list. When Christmas had come and gone and I hadn’t received the book, I decided to nab one of the few copies left at Costco. I had the best of intentions but never really got around to actually cooking a recipe from it in January. I did have a lot of fun reading through many posts of people who enjoyed cooking recipes from the book so I decided to give it another chance. I’m really glad I did. 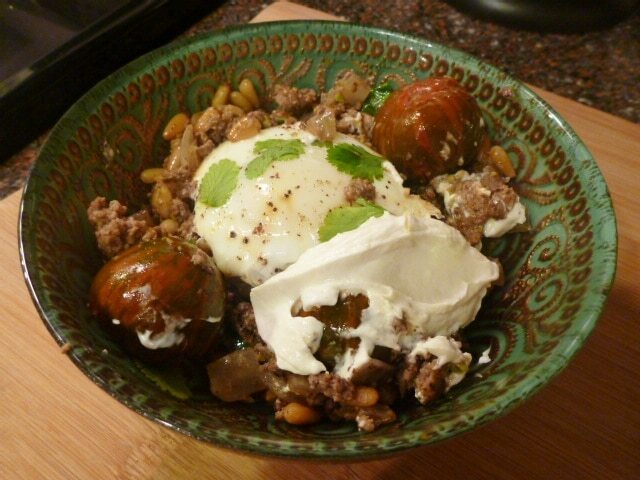 The Second dish that I tried to make and we absolutely LOVED was Braised Eggs with Lamb, Tahini, and Sumac. I’ll admit that I’m not a big fan of lamb and have really only had it once or twice where I could actually enjoy it. Once was lamb chops at a barbecue put on by a Kiwi friend and another was a whole roasted leg of lamb at a dinner party put on by an Iranian friend of ours. Childhood mutton trauma has kept me from truly enjoying lamb to its full potential. Thanks mum! I made a special trip to the butchers’ to get the lamb mince but I basically had all of the other ingredients for the dish on hand. This included some beautiful zebra tomatoes from Gull Valley Greenhouses. 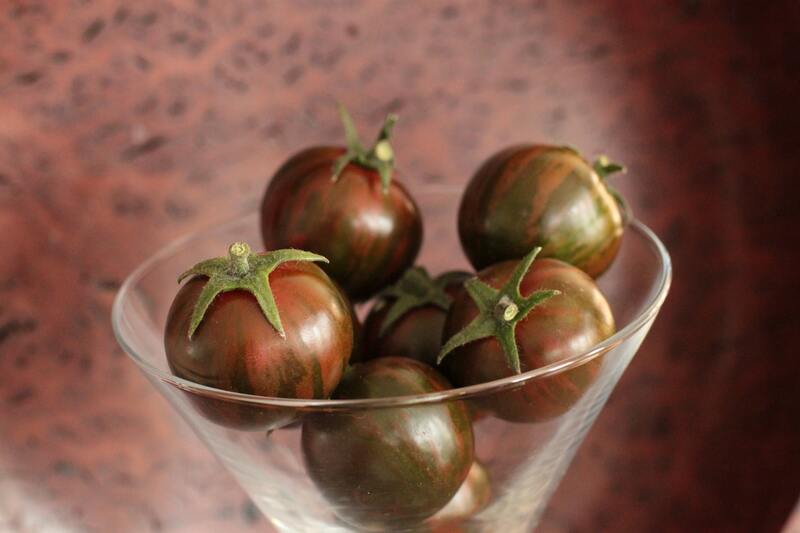 While they are extremely tasty, they don’t bring the contrasting colours the usual red cherry tomatoes would. 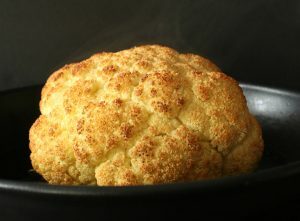 Even though the dish contained several interesting ingredients, I found it really easy to make. The only difficulty I had was getting the yolks to remain soft while the whites cooked. The recipe says to make pockets in the lamb mixture for the eggs to cook in. My pockets must have been a touch too deep. The whole family really enjoyed the flavour of the dish but next time I would serve some sort of flatbread with it and also make more of the Tahini sauce. Please, don’t let the exotic flavours and spices keep you from trying out this cookbook. The third dish from ‘Jerusalem’ that I cooked and loved was also very simple to make. Chicken with Caramelized Onion and Cardamom Rice. 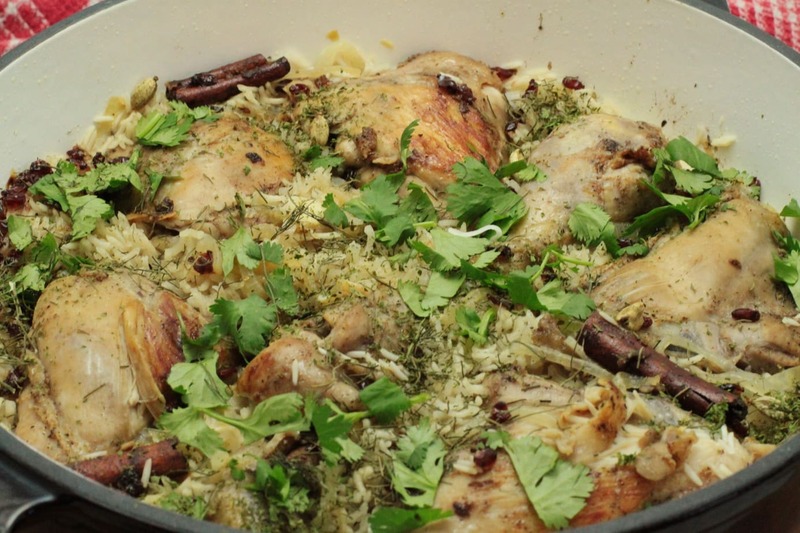 First off, I love anything with Cardamom in it and secondly, cooking the whole meal in one pan really is convenient and flavourful. This dish is super easy. The only reservations I had was that it seems to have a huge amount of salt in it. After frying the chicken a bit longer than required AND also letting the whole pot simmer on the stove longer I still found that the rice and chicken were a bit underdone. There was only one piece of chicken that was underdone and the rice at the top edges of the pan was a bit crunchy. Next time, I will do both just a wee bit longer (and add more boiling water) bringing the cooking time up to 45 minutes. This is also the first time I’ve posted a photo that I took in my new soft light box. I think it is much better than the photos I take at 9 pm under the very difficult lighting circumstances in my kitchen. What do you think?